In this companion guide The Heysen Trail is broken into 58 sections, each comfortably walked in one day. 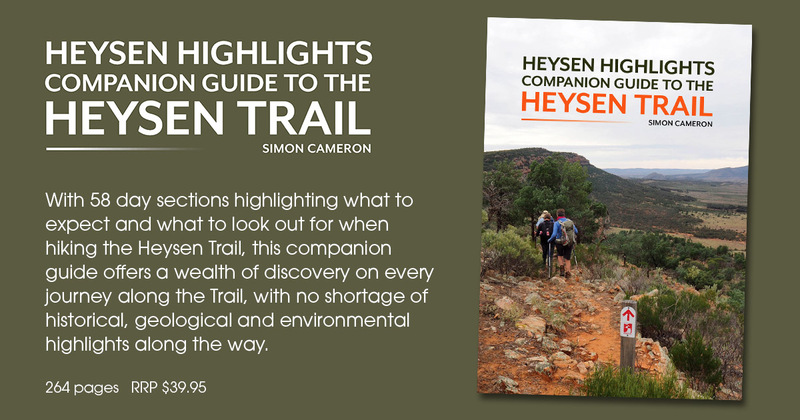 For each day there is a overview of what to expect and what to look out for when hiking the Heysen Trail, this companion guide offers a wealth of discovery on every journey along the Trail, with no shortage of historical, geological and environmental highlights along the way. By explaining the historical context, of the Aboriginal people, European explorers and settlers and the development of the trail, walkers can enrich their experience of the trail and its landscape. Author Simon Cameron joined the Friends of the Heysen Trail in 2001, the same year that he started walking the Trail. He has never stopped walking it. As anyone who has had the joy of walking with Simon will known, there is so much to see and so much to discover along the Trail that there never will be a reason to stop. Buy online for $39.95, with postage from $13.05. Heysen Highlights is broken into 58 sections, based on the Friends’ End-to-End walk programme that carries groups from Cape Jervis to Parachilna Gorge over a series of 60-day walks. “I have combined and adjusted some of the shorter walks to provide 58 sections.” For each day’s walk there is a brief overview of what to expect and what to look out for. The book begins with Cape Jervis so the format favours the south- to-north walker, but the short chapters are intended to be a ‘pre- walk briefing’ and not an ‘in hand’ walking guide. It also passes through a cultural heritage spanning tens of thousands of years of occupation and nearly two centuries of colonial settlement. Even more unique is a geological landscape that spans the origin of animal life itself. “All of this offers a wealth of discovery on every journey along the Heysen Trail and there are no shortage of highlights along the way. In section one, for example, we are told that the southern coast of the Fleurieu Peninsula is difficult to see other than on the Heysen Trail because there is very little vehicle access. It is one of the great coastal walks with rugged cliffs, granite bluffs, untamed ocean, tucked inlets, and wild beaches. All of this is offered with endless seascapes, and nature’s proudest displays of flora and fauna. Dolphins cruise the surf, and sea birds ply the skies while kangaroos and echidnas share the path. The luckiest walkers might see migrating Southern Right Whales. Tapanappa, in section two, is reputed to mean ‘pathway’ or ‘stick to the path,’ which is essential on this coastline. Any attempt to move cross-country is dangerous. A distressing number of rescues and even fatalities have occurred in the Deep Creek Conservation Park. Deep Creek is a true wilderness, to be treated with respect as well as awe. A short detour to the Tapanappa lookout, at the end of the section, captures the natural majesty, and a glance to the east provides a tantalising view of Tunkalilla Beach – another jewel on the Trail. 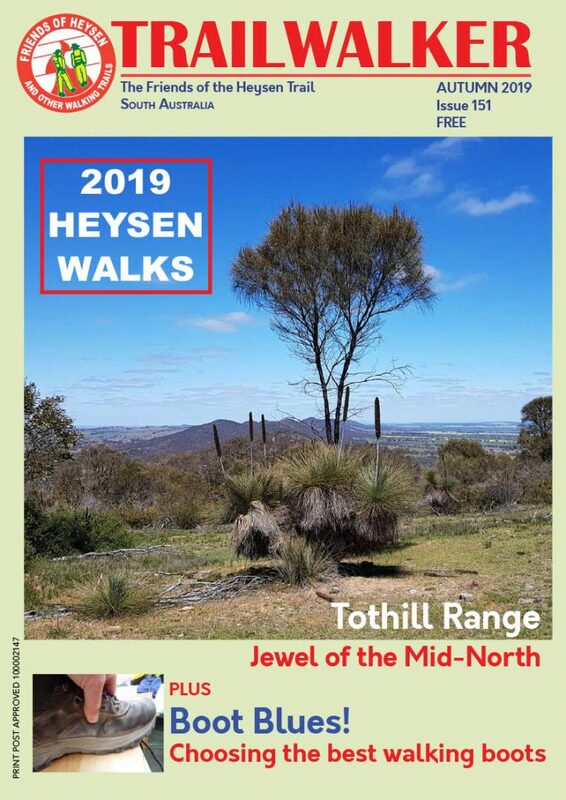 Subscribe to receive email news about the Heysen Trail and our walking programme. Choose the topics to receive news about. Magazine of The Friends of the Heysen Trail, view the latest issue - Autumn 2019 or past issues.